There is another great Lysol coupon available. 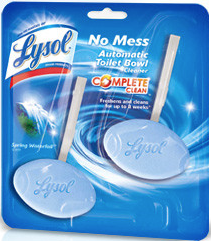 This one is for $1 off any Lysol No Mess automatic Toilet Bowl Cleaner. You will have to “like” the Lysol Facebook page to print the coupon. CVS Coupon: Diet Pepsi or Pepsi 12-pk for $0.99 – 6/15 Only!